After a 2-week price melt-up which lifted Bitcoin (CURRENCY:BTC) higher by 48.61% trough-to-peak, the patriarchal crypto stumbled precipitously this morning. Bitcoin is currently trading down nearly eight percent on heavier volume—right at the session lows. What comes next is this complicated environment is up for discussion, but The Midas Letter will attempt to make sense of it all. We recently articulated our views on the current state of the market in a piece titled Does Recent Bitcoin Strength Portend a Bull Market Revival or Bull Trap Reversal? three days ago. Essentially, we’re neither bulls nor bears in today’s environment. In these low liquidity times, I wouldn’t be surprised if bitcoin broke its all-time highs or stumbled to new intermediate term lows. However, we noted there are some peculiar elements to this bitcoin rally which were not present before. While the bitcoin pumpers started coming out of the woodwork in earnest, we are hesitant to buy into the euphoria based on several factors. The first being that volume on this bounce has been—for lack of a better word—lackluster. As we can glean from the chart below, volume run rate has been well below normal—with the possible exception of April 12—on the whole ride up. While it’s certainly possible BTC is emulating the U.S. equity low volume melt-up rally from 2012-2017, it’s hard to buy into that fact when the investor class hasn’t been sufficiently washed out (like equity investors were post U.S. Housing bubble in 2009). In other words, how can a sustainable low volume melt-up occur when significant latent selling likely exists? Another worrying aspect, from my perspective, is the continued bullish sentiment seen in the bitcoin market. This is perfectly exemplified by the tweet below, and directly related to the above point. How is it possible bitcoin has truly bottomed when sector sentiment remains so elevated? This is not indicative of bear market bottoms—especially bubbles of historic proportions. Thomas Lee is a Managing Partner and the Head of Research at Fundstrat Global Advisors. He is an accomplished Wall Street strategist with over two decades of equity research experience. Tom has also been top ranked by Institutional Investor every year since 1998. In any event, forward expectations appear much too high at this point. When that survey number gets to between 20-30%, perhaps then investors should start getting excited. 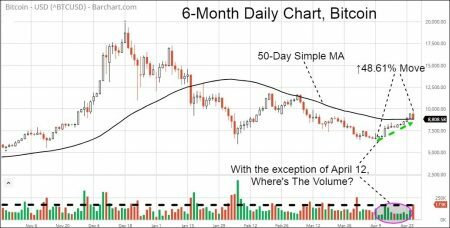 Currently, bitcoin is on pace to procure its highest volume in 4-weeks—and perhaps since early February. The real question going forward is whether today’s drop is more of a one-off selling event or precursor to a sustained bearish pulse. 1) Bitcoin sold right down to its 50-Day MA is precise fashion this morning, and it currently grinding upwards. The key levels to watch are $9,075 BTC on the upside and 8,600 BTC on the downside. A break on volume below/above either level (on volume) could set the stage for a tangible move in either direction. 2) CME Bitcoin Futures Last Trade Date is on Friday, April 27. Expect some erratic price dislocations leading up to expiration. 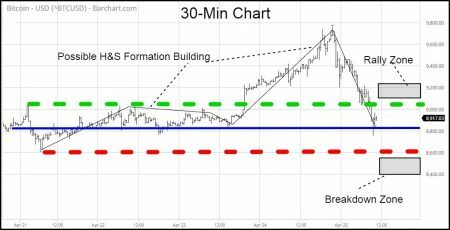 3) A potential head & shoulders formation is forming 30-min daily chart. The areas of support and resistance are generally defined by the levels mentioned above.